It was an unusual sight, that foggy morning in mid-August, 1908. Dozens of women, most of them elderly and all of them clearly well-to-do, judging by their fine clothes and elaborate hats, were standing together in a vacant lot. More unusual was that this group of women jointly owned the property - or rather, it belonged to the corporation they had formed to buy it. And more remarkable still, one of the few men on hand that morning was a noted architect with building plans for a meeting house designed under the direction of these same women. None of this might have been noteworthy in San Francisco, Berkeley, or other places where emergent voices for women's rights and suffrage were loudly heard; but this was taking place in little Santa Rosa, California. It was the ground breaking for the Saturday Afternoon Club. The day must have been deeply gratifying for Mattie Oates, who is seen over the shoulder of architect Brainerd Jones in the only known surviving photograph of her. It was almost four years to the day since construction had started on her fine new home up the street, and here she was again working closely with Jones in her role as chairman of the building committee. Husband James Wyatt Oates had drawn up the papers of incorporation that had made this all possible. The event must have been memorable for Brainerd Jones as well. From where he stood for the photographer, he could see three of his best creations lined up in a row: The Lumsden House (now the Belvedere), the Paxton House, and Mattie's home, which would become known as Comstock House. For the Lumsdens he had built a very pretty Queen Anne - but for the Paxton and Oates families he had created what were probably the most adventurous designs of his career. These homes were in the Eastern Shingle Style/First Bay Region Tradition that strived to be simultaneously rustic and elegant. And now with the similarly brown-shingle clad Saturday Afternoon Club, he made a final statement in an architectural style that he apparently never used again. 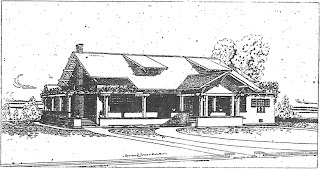 A few years later in 1913, Jones would design a building for the Petaluma Woman's Club that had similar dimensions, but was rendered in a far more conservative style. Only the Saturday Afternoon Club could have built such a place. The town was awash in "ladies' clubs" in that era, most with the sole function of planning afternoon card parties and get-togethers held at member's homes; a Press Democrat columnist guessed there were about 100 women's clubs, lodges and societies then in Santa Rosa. But no cards were shuffled at meetings of the Saturday Afternoon Club, where women might discuss a member's report on military tensions in Asia or listen to an amateur soprano from the club's Etude section warble through a program of Schubert lieder. One of the few personal details we know about Mattie Oates concerns a witty presentation on "The Laws of California as related to Women and Children." The Saturday Afternoon Club was a group firmly in the traditions of the club movement, which was founded after the Civil War and took off around the turn of the century. Members were typically older women from the leisure class who sought intellectual challenge and culture. Such lofty aspirations made them easy targets for satirists and jokesters; think of the scene in "The Music Man" where the mayor's insufferable wife and her dowdy friends clumsily pranced and posed in an ode to a Grecian urn. The Club was founded in 1894 under the leadership of Jeanette Cochrane, a farmer's wife who found Santa Rosa to be a cultural sinkhole under the sway of dullards, at least as compared to her former home of Santa Barbara. There she belonged to a small "woman's club" that discussed literature and lobbied for civic improvements. The Club here certainly pursued literary matters with gusto, but until WWI it was not very active in civic affairs, perhaps because Santa Rosa had a busy "Woman's Improvement Club" that was tirelessly working for the town's betterment, such as coordinating with the S.P.C.A. to raise watering troughs to make them more humane for thirsty horses and cleaning up the Rural Cemetery. Rarely were members of that group singled out by the newspapers, but the names that did appear were almost always prominent members of the Saturday Afternoon Club, suggesting there was substantial overlap between the groups. Central to the success of the Saturday Afternoon Club was its clubhouse, and that almost wasn't built, according to a 1994 Gaye LeBaron column. After the land was purchased from Mark McDonald Jr. for $800, all the banks in town refused to give them a construction loan, saying it was "crazy" to to take a risk on a social club, even one that included the wives of every prominent man in town. A wealthy aunt of club member Laura Cragin finally put up the entire $4,375, with another $100 tossed in for architect Brainerd Jones. Yet curiously, none of those interesting details were mentioned in either Santa Rosa paper at the time, which together printed over three dozen approving items about the Saturday Afternoon Club's mission to establish a clubhouse. Nor is Mrs. Cragin seen in the group photograph at the ground breaking. For having brokered a deal that saved the club's bacon, you'd think that she'd at least be rewarded by a snapshot of her throwing a shovelful of dirt. ...Mrs. Robert Potter Hill, former president of the State Federation of Women's Clubs, and Judge James W. Oates made addresses during the evening. Each of the speakers made a talented address, the ladies bringing greetings from the organizations which they represent, and speaking of the pleasures which they had at being present on so auspicious occasion and of the beneficial influence the erection of the Saturday Afternoon Club structure would have on other cities. Architect Brainerd Jonea was here from Petaluma yesterday looking after the Saturday Afternoon Club's new club house on Tenth street. He expressed himself as well pleased with the manner in which the work is progressing and of the work being done by the contractor. The brick work in the terrace was also commented upon favorably by the architect. Contractor J. B. Durand has the club house under cover so that the rain will not interfere with the force of men engaged on the job. He sees no reason now why the contract will not be completed well within the specified time limit. The new structure being erected for the Saturday Afternoon Club on Tenth street is rapidly being pushed to completion. Contractor J. B. Durand has a force of men busy shingling the sides of the structure, and it will soon be enclosed. Some delay has been occasioned in the structure of the roof, as the heavy timbers for that portion of the structure have been ordered direct from Oregon. They will be here at once, and it is expected to have the roof on the structure before the rains set in. The ladies of the club frequently visit the new structure and are well pleased with what is being done there. The club house, when completed, will fill a long felt want on the part of the ladies of Santa Rosa, and will give them a place where their musicals and other high class entertainments can be staged with proper effect. An exceedingly pretty and impressive, tho' informal ceremony took place at 8 o'clock this morning at the site of the Saturday Afternoon Club House on Tenth street near Mendocino Avenue. The building contractors began work at that hour and the members of the club assembled to break ground. The ceremony was begun by the presidents of the organization, Mrs. Finlaw, the "mother president," turning the first shovelful of earth, and starting the work that will go on till a beautiful and artistic club home is completed. Mrs. Finlaw made a short and appropriate address to her sister members and co-laborers and relinquished the shovel to her successor in office. This was followed down the line presidents, who are Mrs. J. W. Oates, Mrs. A. C. McMeans, Mrs. Mark McDonald, Jr., Miss Lulu Leppo, Mrs. T. J. Geary, Mrs. W. E. McConnell, Mrs. James R. Edwards and Mrs. J. S. Sweet, the present presiding officer. Then the vice presidents took a hand, and this finished the official list and the members--the high privates--did their allotted part in preparing for the foundations. There were present Judge James W. Oates and Professor J. S. Sweet, also Contractor J. B. Durand and Architect Brainerd Jones. John Ross, the photographer, posed the lady builders in an attractive bunch and took several pictures. The shovel will be preserved as a thing sacred in the club house. The contract for the erection of the handsome club house on Tenth street for the Saturday Afternoon Club, has been finally awarded to Contractor J. B. Durand of this city. Work will be commenced at once and will be finished as rapidly as possible. A description of the building and the sketch of the same by Brainerd Jones, the architect, was published in the Press Democrat some weeks ago. The building will cost in the neighborhood of $5,000. An application for a building permit has been filed with the City Council, and will of course be granted. The chairman of the building board is Mrs. James W. Oates. The members of the club will be glad to know that the work of construction is to be commenced and will be delighted when the building is ready for occupancy. Mrs. James S. Sweet is the president of the Saturday Afternoon Club. After some delay incident to certain alterations in the original plans, on Thursday morning the contract was signed with J. B. Durand to erect the elegant new home for the Saturday Afternoon Club on Tenth street, near Mendocino avenue. This building is the first to be devoted exclusively to club purposes in this city and marks an epoch in the history of Santa Rosa. The ladies of the Building Committee have displayed much energy and business ability in their efforts toward providing the Club with suitable quarters, and they are to be congratulated on the consummation of their undertaking. 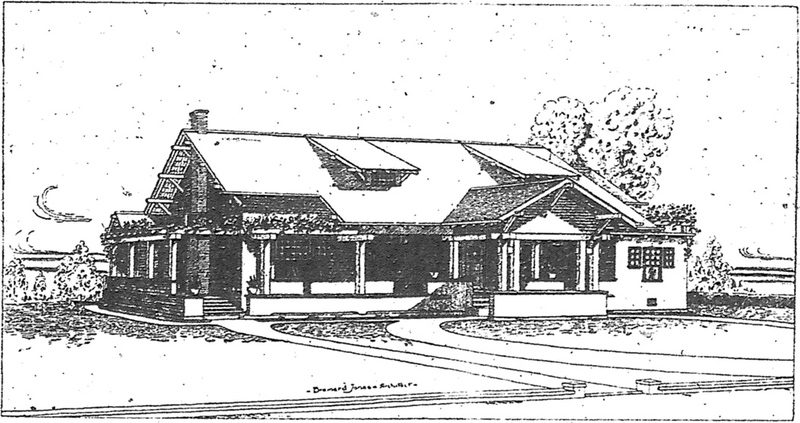 The plans, which were drawn by Brainerd Jones, are in the Chalet style of architecture. The exterior is to be wholly in shingles and with its spacious port-cochere, pergolas and porches, forms a very pleasing picture. The large auditorium, lighted by electricity, will be floored with polished maple. Opposite the stage is a large fireplace and over this is a gallery thirty-six feet in length. From the stage open two dressing rooms provided with all conveniences. The kitchen is to be furnished with a gas range, instantaneous water heater, etc. The auditorium will be wainscoted to the height of seven feet to the plaster line. A unique feature of the finish is the use of stained shakes to ceil the roof under the main rafters. The acoustic properties have been carefully considered by the architect and the building is admirably adapted to lectures and threatening, while the dancing floor will be unsurpassed in the city. All in all, the new building will be an ornament to Santa Rosa and a credit to the enterprising members of the Saturday Afternoon Club. When the ladies of the Saturday Afternoon Club elect which set of the several plans they are wrinkling their fair brows over, they will begin to build a club home that will be an ornament to Santa Rosa and a joy forever to club women who will dwell therein. The idea uppermost in the minds of the members of the organization is a pretty and commodious club house. It will not be costly nor elaborate in its adornments, but will be simple, artistic and genteel. Club homes are now considered necessary in social and fraternal organizations. The Elks in this city built themselves a splendid place where the cultured members of the order meet and enjoy the social features of their order. It is their rallying point and their home. The local Native Sons are now building a costly temple and it will be their fraternal and social home. Finely equipped club rooms will be a part of construction where the members will gather. The Saturday Afternoon club house may be a rustic bungalow, wide eves, ornamental galleries, French windows, giving onto grace 11 balconies and terraces, approached by a broad driveway, sweeping in a half circle up through a porte cochere or roofed entrance at the front. The interior will be a large club room, capable of seating several hundred persons, elevated gallery at one end, with ornamental balcony where one may sit and enjoy refreshments and the literary menu from the floor below at the same time. Piano and other musical instruments will be provided for the Etude Section. Flowers and greenery will grow around and over this artistic structure and it will be a home indeed to the Saturday Afternoon Club of Santa Rosa. At the next meeting, the club will choose the plan and the building will begin. ...A big step in the advancement of club life in our little city was taken on last Monday afternoon, at a special meeting of the Saturday Afternoon Club, held at the home of Mrs. Dr. C. H. Thompson. The object of the meeting was to discuss and decide upon the advisability of purchasing a lot and erecting a modern, up-to-date club house that would not only afford a great deal of pleasure to the members of the club, but would also yield them a good revenue by being rented to other clubs and individuals for social functions and various other purposes. 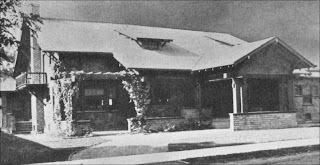 The meeting was largely attended in spite of the inclement weather and the ladies were most enthusiastic and earnest in discussing the proposed plan, and after carefully considering the important question and looking at it from all sides, a vote was taken upon it that resulted in a unanimous decision in favor of building a club house as soon as possible and also an order to file articles at once and incorporate the club under the name of "The Saturday Afternoon Club." Judge J. W. Oates has kindly offered his legal advice and assistance in their future business transactions and the ladies appreciate this generous offer and realize how valuable and helpful Judge Oates can be to them in carrying out such a big undertaking. At the meeting of the Saturday Afternoon Club held Monday evening, the members determined to incorporate, purchase the proposed site for their handsome club rooms and erect a large and commodious structure thereon, The meeting was one of the most enthusiastic ever held by the ladies and when it came to a vote on the proposition there was a unanimity of sentiment favoring the club house. Mrs. James R. Edwards, president of the club, presided at the meeting. ...The club has decided to incorporate under the name of "The Saturday Afternoon Club," and the articles will be prepared at once and filed. At subsequent meetings of the club the arrangements for the building will be undertaken and architects will be asked to submit plans for the structure. The members can be depended on to erect one of the most beautiful and cozy structures for their occupance that is contained in the City of Roses. There is to be an important meeting of the Saturday Afternoon Club, both sections, on Monday afternoon at the residence of Mrs. Dr. C. H. Thompson, on Mendocino avenue, for the purpose of discussing incorporation, for the purchase of a lot at Tenth and Joe Davis streets, and the erection of a club house. It is hoped that all the members will be present and take part in the discussion. Most of the members are very enthusiastic over the probable purchase of the lot and owning their own club house. Mrs. James R. Edwards is the president of the Saturday Afternoon Club. While many lots have been considered it is certain that the club house will be located in or near the location mentioned, which is the locality in which the Saturday Afternoon Club had its origin and development. The Saturday Afternoon Club, Santa Rosa's foremost organization in music and literature, whose handsome club house was dedicated Thursday evening, was founded by five prominent ladies of this vicinity. Many years ago a meeting was held at the resident [sic] of Dr. William Finlaw, on Mendocino avenue, the ladies present being guests Mrs. Dr. Wylie, on McDonald avenue. The idea of forming the club was broached and discussed by these ladies, and from that inception the stately edifice has arisen to crown their splendit efforts. The ladies were Mrs. Martin Cochrane of Kenwood, Mrs. William Finlaw, Mrs. A. C. McMeans, Mrs. Mark L. McDonald, Sr., and Mrs. J. G. Wylie. The first officers of the club were Mrs. Finlaw, president; Miss Nellie Porter, vice president; Mrs. McMeans, secretary; Mrs. McDonald, Mrs. Wylie and Mrs. Cochrane, committee on constitution and by-laws. At the next meeting of the ladies, which was held at the residence of Mrs. Finlaw, the constitution and by-laws of the club were presented and adopted. Miss Nellie Porter, who was chosen vice president of the club, was to have been president of the club, was to have been present at the original meeting, but was unavoidably detained. She was chosen an officer in her absence. I have the Ashland Cook Book compiled and published by the Ladies of the Saturday Afternoon Club in Ashland, Oregon. It's dated 1903. Does anyone else have a copy?